I have seen a lot of 3D printed chess sets in my day, it seems to be a project that just cries out to 3D print enthusiasts, almost as a rite of passage. The sets have ranged from the sublime to the ridiculous to the downright ugly and just when I thought I couldn’t possibly stomach one more, my editor sent me a story on a chess game created by Studioqubed. Although still wary, I was hopeful as the designers at Studioqubed have been the creators of amazing pieces in the past, such as a 16″ high 3D printed model of The War Machine for Denver’s Comic Con back in July. 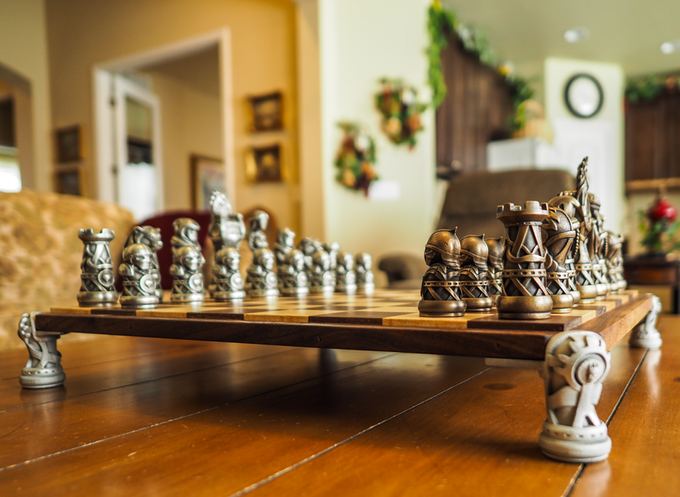 The battle on the board rages between the family of the Bear King and that of the Eagle King on a specially designed board either in a full-size or a travel-size set. I have to say that in the case of this chess set, Craig Turley and George Barnes, designers at Studioqubed, have outdone themselves. Called The Art of War, the game pieces are inspired by medieval imagery with a twist of modern fantasy aesthetic and they are beautiful. The pieces were first sculpted digitally and then printed on a high-resolution DLP-SLA 3D printer. The 3D printed pieces were then used to create a series of master molds. The pieces themselves are then created in bronze using the ancient cire perdue, or lost wax, technique. In lost wax casting, a mold is made of the object to be replicated, that mold is then coated with a layer of hardened wax, the wax cast is covered with a fire-proof mold and heated in an oven, allowing the wax to melt and flow out. Liquid bronze, in this case either white or yellow depending on the family to which the piece belongs, is then poured into the empty casting mold. Once the bronze has cooled, it is removed from the mold and the cast piece is ready for final finishing. The technique of lost wax casting is an ancient one, the oldest known examples being objects from the Cave of the Treasure in southern Israel dating to approximately 3,700 BCE. The meeting of the millennia-old technique and the latest in additive manufacturing technology combines in pieces that have a very satisfying material sense combined with a very precise level of detail. The materiality of the pieces is further enhanced by the hand finishing techniques used by local bronze artisans to bring the pieces to their final state. When you see these pieces, there is a nearly immediate desire to hold one, to feel its weight. The texture and tonal variations produced by hand finishing combined with the weight of the pieces is the result of an understanding by the designers at Studioqubed that there is more than just external form that leads to beauty. To move their idea from prototype to production, they have created a Kickstarter campaign to raise $5,000. Still running until October 10th, they have already surpassed their funding goal. These are not inexpensive pieces, but if you’re looking for a cheap chess set, they are everywhere. Instead, with these pieces, you have a work of art to be appreciated for its beauty as much as for the game, truly the art of war. Let the games begin. 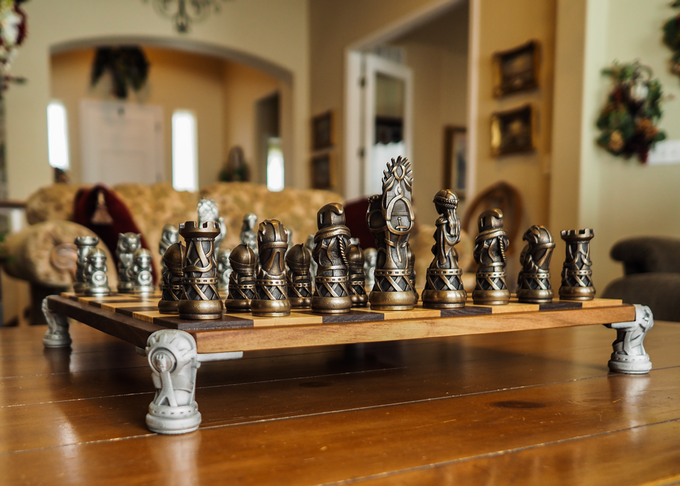 Discuss this story in the 3D Printed Throne of Kings Chess Set Forum thread on 3DPB.com.